This chapter assesses the tools and strategies used to evaluate the need for change in NPOs. It briefly outlines the organizational development approach to diagnosing change and presents a model for addressing the technical, political and cultural dynamics of the organization. 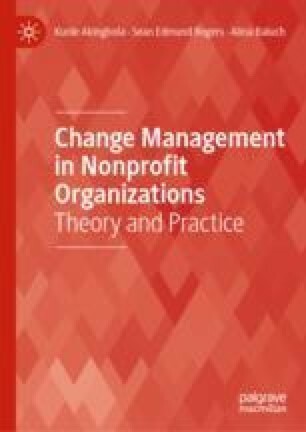 Drawing on work on change management from an organizational studies perspective, it thereafter considers how NPOs can specify the change challenge, use stakeholder mapping and diagnose the cultural aspects of change. Baluch also highlights research from the nonprofit field that provides examples of change analysis tools and processes, alongside key empirical findings. The chapter concludes with a discussion of the main implications for diagnosing change in NPOs.